Kurdish Afrin Falls to Turkey: Turkish Government Official: "Europe Will be Muslim"
Turkey Islamized northern Cyprus through a military invasion in 1974. To Islamize the much more powerful European continent, however, Turkey has been promoting demographic, rather than military, jihad. "The places where you work and live are your homelands and new countries now... Drive the best cars. Live in the most beautiful houses. Make five children -- not just three. For you are the future of Europe." — Turkish President Recep Tayyip Erdoğan, 2017. Yesterday, while many Europeans are still pilloried for viewing mass migration from Muslim-majority countries as a threat to Western culture -- and are still accused of "xenophobia," "Islamophobia" and "fear-mongering" -- the city of Afrin, in the Kurdish area of Syria, fell to Turkey. "The fortune and wealth of the world is moving from the West to the East. Europe is going through a time that is out of the ordinary. Its population is declining and aging. It has a very old population. So, people coming from outside get the jobs there. But Europe has this problem. All of the newcomers are Muslim. From Morocco, Tunisia, Algeria, Afghanistan, Pakistan, Iraq, Iran, Syria, and Turkey. Those who come from these places are Muslim. It is now at such a level that the most popular name in Brussels, Belgium is Mohammed. The second most popular name is Melih [Malih] and the third one is Ayşe [Aisha]." "the Muslim population will outnumber the Christian population in Europe. This... has increased the nationalistic, xenophobic and anti-Islam rhetoric there. Hence, marginal, small parties have started to get large numbers of votes... But there is no remedy for it. Europe will be Muslim. We will be effective there, Allah willing. I am sure of that." "We need a young and dynamic population... Right now, the West is in trouble. But we do not want to put Turkey in the same trouble. I am calling on my country through mothers: Do not take this sensitivity of ours lightly. We need to make this widespread, in waves. We need to make this happen. The [value] of this cannot be measured with money or any other physical wealth." "The places where you work and live are your homelands and new countries now. Lay a tight claim to those places. Open more businesses and enroll your children in better schools. Live with your families in better neighborhoods. Drive the best cars. Live in the most beautiful houses. Make five children -- not just three. For you are the future of Europe." Erdoğan is now also saying the same thing to Turks in Cyprus. During a recent meeting with the prime minister and deputy prime minister of the "Turkish Republic of Northern Cyprus" (recognized only by Turkey), Erdoğan reportedly said, "Economic growth happens in parallel with population growth. The population of Greek Cypriots is more than one million. Just make your own population grow." Turkey already largely Islamized and Turkified northern Cyprus through a military invasion in 1974. The Turkish military terrorized the indigenous Greek Cypriots, causing them to flee to the south. The Turkish government then imported thousands of illegal settlers from Turkey to northern Cyprus, to change the demographic structure of the illegally occupied territories. To Islamize the much more powerful European continent, however, Turkey has been promoting demographic, rather than military, jihad. This attempt by Ankara to guarantee that Muslims outnumber Christians globally has been accompanied by the erection of mosques – "from Europe to Africa, from the Balkans to the Central Asia" -- by Turkey's government-funded Diyanet (Religious Affairs General Directorate). Charles Martel of France and John Sobieke, King of Poland, responsible for driving the Muslim armies out of southern France and Northern Europe (at the Siege of Vienna in 1683) must be rolling in their graves. They would be horrified to see that today's leaders have opened the gates of modern Europe with welcoming arms. Hijrah (migration to dominate) is working because Western citizens are being browbeaten by governments, churches, synagogues, mosques, left-wing media and leftists in general into thinking that to advocate for sensible immigration based on the concept of bringing people who will integrate and become a part of and help develop Western civilization is wrong. So we open the doors to everyone despite the fact that many bring jihadist-terrorist beliefs and objectives to their new homes which quickly become as hellish and terror-ridden as the places they destroyed in the Islamic countries they left behind. Also, in Western society the environmental movement and feminist movements conspire to rip apart families and prevent childbearing – increase abortions – demonize white men – but never criticize Muslims because their beliefs are seen as sacrosanct and special – a quaint throwback to a mythical past that they adore despite the evil therein and the looming and ongoing replacement of good for evil. When the Ottoman Empire began to expand in the 13th century and move into Europe in the 14th century their objective was to conquer Europe under the Islamic flag. They succeeded in conquering southeastern Europe, and Greece. They slaughtered Armenian and Assyrian Christians, and destroyed Eastern Orthodox churches, as well as cultural and historical monuments. Erdogan wants to re-establish the Ottoman Empire and it looks like he will finally conquer Europe like the Trojan horse conquered Troy. And then eventually Western Europe will be like all other nations where muslims are in majority, a dystopia, ineffective, corrupt, class and clan ruled, imperialistic and at last bankrupt because everybody are waiting for Allah to provide them, and therefore their own productivity is similar to nil. Please correct me if you think I am wrong. The Turks still cry about the loss of their beautiful Buda and Pest. The Turks want revenge after their two catastrophic and humiliating defeats at Vienna. I sure hope that Uzay Bulut has good protection against Turkish murderers. Turkish tradition is genocidal, the Armenian, the Orthodox Christians and now the Kurds outside Turkey since they have been at it in turkey long enough. The only question remaining is why is the West so silent about Turkish Islamic terror and genocide? Why is Turkey still occupying north Cyprus? Why is Turkey still a member of NATO? I'm upset at the illegal Turkish invasion of Kurdish Afrin, but since Turkish women, like Iranian women and Moslem women in pre-1967 Israel, Judea, Samaria and Gaza, are barely having 2 children on average, with all the pushing Erdogan is doing, and it is going towards 1.5 children per woman on average, the Moslems have a bigger problem than we do. In Europe, it is a problem, because Moslems there are not working, but having kids to take advantage of the cradle to grave benefits. If European countries would stop subsidising them, the Moslems there would cut down the number of children they have, as well. An excellent article from Uzay Bulut which clearly demonstrates the dangerous situation that Europe now finds itself in. I fear that the pinkos have got an appalling grip on European politics & that they have created a state of fear with those who would dare to speak out. Clearly, Merkel & her single-bloody minded deluded self has allowed Turkey to take over Germany & clearly now has greater ambitions. I fear the Turkish President Recep Tayyip Erdoğan see's himself as the new leader that is going to recreate the Ottoman Empire & their be no one to stop him in the West. maybe, the West should consider doing a deal with the devil & yes I'm talking about Putin. As the saying goes if Christianity fails in the West Mother Russia will save us but at what price? The peoples of Europe need to wake up if they wish to keep their identity. I foresee a new European war but this time it will not be country against country it will be religion against religion. Nothing but force, destroying the Turkish troops in Syria and Cyprus, and driving Muslims out of Europe, will restore the situation -- but, the ruling class in Europe are promoting the invasion, they're surely not going to stop it. Europe is lost, unless the public rebels and acts on their own, in defiance of their governments. The US could end Erdogan's adventurism in Syria, but Trump's domestic political problems may prevent him from acting. 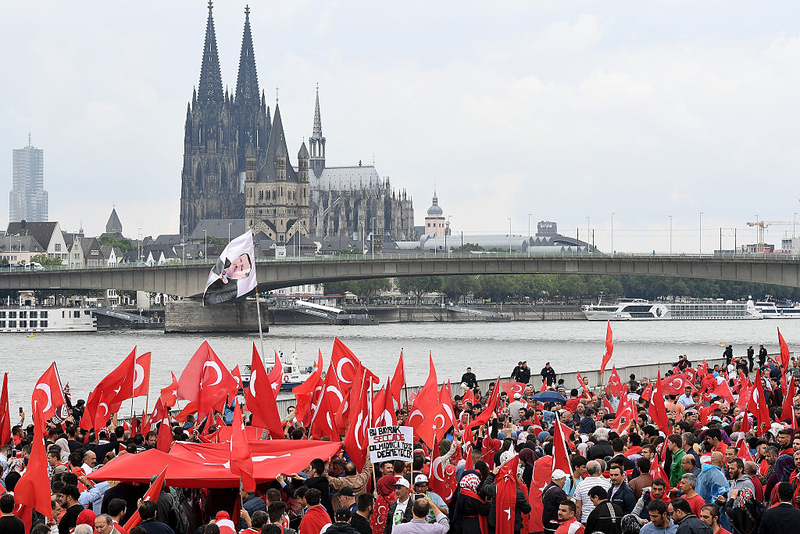 None of this is likely to end well -- the choices are narrowing down to Islamic rule in Europe, or war in the streets -- and more military conquest by Turkey, unless someone is willing to confront them.